← Who’s afraid of the Big Bad Boar? For those who may be new to the authorship question or who haven’t been able to piece together a full scenario from the hodge podge of my necessarily brief posts and pages, here’s a quick overview (well, as quick as possible) of the structure behind, not just the Shakespeare authorship issue, but my view of the entire English Literary Renaissance. For more on each point, follow the links. 1550: The true author of the Shakespeare canon was born into a dysfunctional aristocratic English family in northwest Essex at almost the exact midpoint of the 16th century. Four years later, due to the unstable political conditions surrounding the transfer of power from the first Reformation government under Edward VI to the Catholic government of his sister Mary Tudor, those who were concerned about the safety of the heir to the great Oxford earldom arranged for him to be transferred to the care of the nation’s leading statesmen and Greek scholar, Sir Thomas Smith. At the time that de Vere came to live and study with him, Smith was living at Ankerwycke, a renovated priory on the northern bank of the Thames, a stone’s throw from today’s Heathrow airport. Smith and his recently married second wife had no children, nor is there evidence of any other child raised in their household, suggesting that de Vere had a solitary childhood in terms of relationships with children his own age and of his rank. Like other isolated children, he found companions in the heroes whose adventures he read about in books in Smith’s library, many appearing later in plays by Shakespeare. During the five years of “Bloody Mary’s” Catholic reign, Smith and the other Reformation activists from Edward’s reign who stayed in England kept quietly to themselves. Though it’s very possible that along with Smith and his wife, de Vere attended holiday festivities at nearby Windsor Castle where he would have seen plays and concerts and spent time with his parents and other members of the large family into which he was born, it’s unlikely that, except for five months at Cambridge in his ninth year, he spent much time away from Ankerwycke during the years when Reformers like Smith, among them his former colleagues, John Cheke of Cambridge and Archbishop Thomas Cranmer , were being rounded up, imprisoned, tortured and executed. With the death of Mary in 1558, eight-year-old de Vere was shuffled off to his tutor’s college so Smith could take part in preparations for Elizabeth’s coronation. When it became clear that he would not be getting the appointment to the Privy Council that he expected, Smith returned to his new estate, Hill Hall in Essex, to which de Vere too then returned. Two years later, when his father’s death handed his fate over to the Crown and the Court of Wards, the now twelve-year-old Earl of Oxford came to to live with Smith’s former student, Sir William Cecil, now Queen Elizabeth’s Principal Secretary and Master of the Court of Wards, at his new mansion in London’s West End. There he studied ancient Anglo Saxon poetry and law under Laurence Nowell and the arts of the courtier under various masters of dancing, music, fencing, horsemanship and French pronunciation. As a member of the household, de Vere formed a brotherly relationship with Cecil’s six-year-old daughter Anne and came to know their relatives, the Bacons, who lived up the road at York House: Anne Bacon, Mildred Cecil’s younger sister, her husband Sir Nicholas Bacon, William Cecil’s colleague on the Privy Council, and their small sons, toddlers Anthony and Francis, who, with their mother as instructor, could already babble charmingly in Latin. Later the following year the Cecil’s only son, Robert, was born, and shortly after that Oxford’s first close friend, Edward Manners, Earl of Rutland, joined the household as the second ward of the Crown to come under Cecil’s care. There they made friends with the young translators who congregated at Cecil House, most of them six to ten years their seniors. Although the evidence is slim, it’s possible that from 1564 to 1566, under the name “Richard Vere,” the 14-to-16-year-old Oxford studied at Christ’s Church Oxford under the care of Canon Thomas Bernard, where he wrote and directed the play Palamon and Arcite for the 1566 commencement (later revised by John Fletcher as Two Noble Kinsmen). Earlier he did the same for the 1564 commencement at Cambridge, writing and directing the (extremely juvenile) play Damon and Pythias. Both plays reflect his friendship for Rutland (both were attributed at the time to Richard Edwards, master of the Children of the Queen’s Chapel). In February 1567 Cecil had him enrolled at Gray’s Inn in Westminster, signalling his return to London, Cecil House, and the Court. By 1565 Oxford had written two plays for the West End community performed at Christmas at Gray’s Inn: one a translation of the comedy I Suppositi by Ariosto, the other Jocaste, a loose translation of a Sophocles tragedy. Also in 1565 he published the first four books of his translation of Ovid’s The Metamorphoses, published as by his uncle Arthur Golding; an anthology of tales translated by himself and his friends at Cecil House from numerous ancient and Continental authors (most of them found in Smith’s library) titled Painter’s Palace of Pleasure; and a collection of poems (Eclogues) by his friend Barnabe Googe. By seventeen Oxford was living and travelling with the Royal Court and involved with the production of Court entertainments. Like many other underage peers, he was forced to borrow from money-lenders to maintain his image as a Court dandy and patron of writers, musicians and companions. These last included his cousin Henry Howard, who introduced him to Catholicism. Though drawn by the Catholic panoply of art and music, so absent from the Reformation culture that had surrounded him since early childhood, yet the ancient belief system instill in him by Smith remained that of a Greek cycnic. Among those he employed were several of his father’s retainers that, following his death, Cecil had taken into his own employ, among them the son of one John Lyly. He may also have sponsored the actors from his father’s old company. As he approached and then passed his 21st birthday he continued his publishing ventures by putting into print Bartholomew Clerke’s Latin translation of Castiglione’s The Courtier and his friend Tom Bedingfield’s Cardanus Comforte, a translation from Latin of Gerolamo Cardano’s popular de Consolatione. In 1574 he published the first of the early anthologies, One Hundreth Sundrie Flowres, a collection of his own poems plus some by his friends, the plays he produced at Gray’s Inn, and a tale in prose, “The Adventures of Master FI,” the first of the sort of pastoral novella he would later publish in series as by Robert Greene, the name of one of his copyholders in Essex. At twenty-one, yielding to tradition (and fiscal necessity), he allowed himself to be married to his guardian’s daughter, poor Anne Cecil, who got caught right away in the tension between her husband and her parents. By 1575, he was finally allowed to take the traditional finale to a peer’s education, a tour of European capitals, and he set off for Italy, visiting in turn every locale in France and Italy portrayed later by Shakespeare. While Oxford was away, issues arose around his indebtedness to money-lenders and those members of his family to whom his father had granted large innuities. He staved these off by demanding that Cecil, who had charge of his estates, sell enough to pay his debts, something that the tight-fisted Cecil, whose eye was on the future of his daughter and her progeny, stalled on doing so that the interest continued to mount. It was as much out of fury at this situation as at the rumors that Anne had been unfaithful that Oxford broke off with her and her father upon his return from Italy. This meant that she and their daughter continued to suffer for years from ugly rumors that the child was the product of an illicit affair, a tragic ploy that would haunt him for the rest of his life and that would form the plot or subplot of at least six of the Shakespeare plays. In the weeks following Oxford’s return, the first of the first two successful commercial theaters in England sprang to life, the big public theater built by James Burbage for Hunsdon’s Men in the Liberty of Norton Folgate in Shoreditch, a short distance on the Bishopsgate road leading north out of Central London. Five months after his return, the second successful commercial theater opened its doors, this one the small private stage created as a rehearsal space for the Children of the Queen’s Chapel in the old Revels building in the Liberty of Blackfriars. The first served the public of the East End, the other the posh community of peers and educated parliamentarians of the West End. Titles of all but one of the anonymous plays performed at Court that winter by both the adult companies and the boys suggest Oxford’s authorship. By 1580 Oxford was living at Fisher’s Folly, a manor just outside the City Wall, roughly halfway between the City theater inns and Burbage’s public stage. That Christmas he felt compelled to reveal to the Queen and leading members of the Court the fact that he’d found himself drawn by his cousin, Henry Howard, into a Catholic conspiracy that seemed to pose a threat to her life. He was forgiven, while Howard and his cohort Charles Arundel landed in prison, which caused them to launch a series of scurilous counter charges against Oxford that stuck with many members of the Court community and that have damaged his reputation with historians ever since. Having escaped the immediate consequences of their libels, he proceeded to get caught in a sexual liason with one of the Queen’s maids of honor. This sent him to the Tower for two months (March through May), at which point he was released to house arrest. Banished from Court indefinitely, he turned his skills towards writing more personally satisfying plays for the adult companies to perform at the little Blackfriars theater school for his favorite audience, the West End community. This did not go well with the residents of Blackfriars, and soon the teachers who ran the school and their patrons, himself included, found themselves threatened with the loss of the stage that gave them access to the Westminster audience. 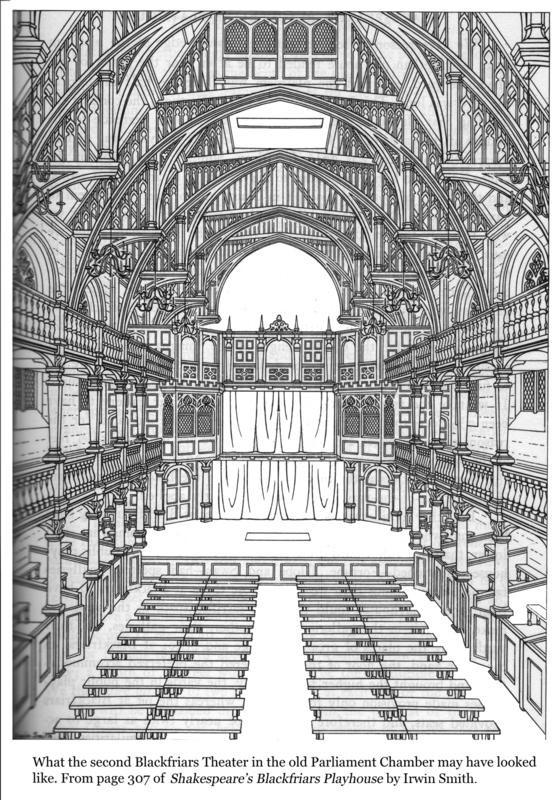 Although the choristers school was forced to merge with the one at Paul’s Cathedral in 1584, the stage itself probably continued to function on a less public basis for another six years. There Burbage’s adult company was able to perform early versions of plays like Romeo and Juliet, Merchant of Venice, Julius Caesar and Hamlet for the West End community, plays they could never have performed at Court. When Sir Thomas Smith died in 1577, his friend and colleague Sir Francis Walsingham took over as Secretary of State. Six years later, when Lord Chamberlain Sussex died, Walsingham took over as patron of the Court stage, which, through Oxford’s activities and those of his patrons and actors, was in the process of developing into the London commercial stage. Walsingham, who lived just around the corner from Fisher’s Folly, and who was under pressure to prepare for war with Spain, saw in Oxford’s household of secretaries and musicians a sort of unofficial propaganda office. Funding it at first from his own pocket, then persuading the Queen to kick in, he had Oxford providing the newly-formed Royal touring company, the Queen’s Men, with plays to perform in the shires, plays that dramatized for the provincial English some notable moments in their history. This it was hoped would raise their national pride to a level that those who still saw themselves as Catholics would decline, when the Spanish attacked, to sell out for religious reasons. Out of this came the early versions of Henry V, Richard II, Richard III, and the three Henry VI plays, plus all the plays now assigned to Robert Greene and most of the Shakespeare Apocrypha. During his banishment, Oxford took a step towards providing the reading public with some of the tales he had written in the ’60s and ’70s to amuse the Court, but it wasn’t until he was back in 1583 that he followed through, publishing the pamphlet Mamillia as by Robert Greene, the name of one of his Essex copyholders. Its almost immediate popularity spurred him to publish others, and soon, perhaps to his surprise, he found himself with an enthusiastic and expanding reading audience. Through the dedications to these Greek romance-like stories he found a convenient way to acknowledge Court figures that, for one reason or another, he thought deserved recognition, or who could reward the bearer of a complimentary copy (one of his secretaries?) with a sizable donation. Thus was Oxford not only Shakespeare, not only the intitiator of the London Stage, he was also the initiator of the English periodical press, a phenomenon that spread rapidly, developing in later centuries into regular newsletters, then newspapers and magazines. In 1578, 18-year-old Francis Bacon had arrived back in England for his father’s funeral. Unable to return to Paris for lack of funds (his father died before providing him with a living), and with nothing more important to do, Bacon hooked up with Oxford, falling quickly into the role of Puck to his Oberon. Oxford returned the favor by getting him connected with printers who would publish his poems, anonymously at first, then, with Sir Walter Raleigh’s help, as Edmund Spenser. With the real Spenser far off in the wilds of southern Ireland, and with Raleigh willing to see to it that he got a regular stipend for the use of his name, Bacon was encouraged to publish a wide variety of his writings, including such divergent works as The Faerie Queene, written to entertain the Queen and her ladies, and Mother Hubberd’s Cupboard, an opening shot in his lifelong pushback against his uncle Burghley. Lacking a paying Court position, Bacon was forced to provide for himself by working as a high level secretary to Court figures in need of politically sensitive, well-worded letters and official documents. First among these was Sir Francis Walsingham, who, when Oxford refused to write for the Court in 1581, urged him to step in with plays for the boys to perform in a style that came as close as he could manage to the euphuism that the Queen enjoyed and that were directed and staged by Oxford’s secretary John Lyly. By the end of the decade there were eight of these, which, like Oxford’s Euphues novels, were later published as by Lyly. The following year the world of pamphlet publishing was rocked by the publication of the anonymous “Martin Mar-prelate” anti-cleric satires. The bishops were furious, but their efforts to defend the newborn Anglican establishment only made them look pathetic. In desperation they enlisted Oxford and Bacon to mount a counterattack. Oxford’s lacked fire (probably because he found Martin hilarious), but Bacon, who had been struggling for years to find a genuine voice of his own, saw the light! Adapting Martin’s slangy rant to his own purposes, he lashed out at Martin, fighting fire with fire with delirious abandon. As the 1580s wore on, the impending threat of attack by Spain had brought a level of power to Secretary of State Walsingham that did not sit well with Lord Burghley, who by the Armada showdown had begun to see his former protégé as more of a rival than the obsequious junior he would have preferred. With Walsingham’s death in early 1590 came the opportunity he’d been waiting for. While he himself moved quickly to take over the public side of the Secretary’s office, he turned over Walsingham’s secret service agencies to his son, 27-year-old Robert Cecil. Eager to show the Court in general and his frolicsome cousins in particular that he was a force to be reckoned with, Cecil created a sting that culminated in January 1592 whereby Marlowe could have been jailed under suspicion of coining, to be followed no doubt by the usual tribunal and execution. When that failed to pan out, the next opportunity appeared a few months later when early signs of plague appeared. Centuries of experience had taught the English that it would hit with full force the following spring, giving Cecil time to create another virtually flawless sting operation, which did in fact go off without a hitch. Marlowe was caught, trapped, and either executed or transported overseas, with a corpse from another recent execution substitued in his place. That Oxford had been warned in advance that trouble was on its way seems clear from the way that at the first warning of the plague in the summer of 1592 he rid himself of his Robert Greene persona. That he included in Greene’s final “deathbed” pamphlet a warning that Marlowe was headed for trouble makes it almost a certainty. That Bacon was frightened by Marlowe’s murder is evident from the fact that the book that he had ready to publish, the larky Jack Wilton, got set aside as he rushed to print instead the morose Christ’s Teares over Jerusalem. A few months later, having recovered his nerve, he published that masterpiece of English satire, Piers (Purse) Penniless, in which he descants with stunning wit on his irksome poverty and the human devils that it forces him to deal with. Burghley had already taken steps in 1588 (following his daughter’s death) to shut down Oxford’s operation by allowing his debts to the Court of Wards to be called in, forcing him to rid himself of anything that could be confiscated by the Crown or his other creditors, including Fisher’s Folly. With bankruptcy hanging over him, Oxford found himself for the first time utterly unable to continue to support his staff (note the story of the grasshopper and the ant in Greene’s Groatsworth) or to raise any cash at all. In fact, it seems that at one point he fell so low that he had to turn to his former retainers for handouts. Feeling deserted and at a loss, when a young nobleman offered financial support for his new play (a revised Romeo and Juliet? ), Oxford felt a gratitude that blossomed into love. Now in his forties, his wife dead and with no heir to carry on his ancient name, his oldest and dearest friend gone, drenched with remorse over his treatment of his wife and his affair with his patron’s mistress, his heart went out to this handsome young peer. In hopes of seeing him wed to his daughter, in 1590 he wrote 17 sonnets for the boy’s 17th birthday and gave them to him bound in velvet. The youth’s response sent him into raptures of sonneteering. Using the sonnet form created by his great uncle the Earl of Surrey, in verse after verse, a new voice began to appear. Chasing the youth, chasing this new and powerful voice, he kept on writing. As always in times of trouble, writing was his tonic, his escape. November 1588 had seen the arrival on the London scene of 27-year-old Mary Sidney, Philip’s sister, who ended her two years of mourning for her brother by arriving at the Armada victory celebration in full Countess regalia and in a coach painted in Sidney colors. Having produced the requisite heirs for her husband, the Earl of Pembroke, Mary was out to live life the way she wanted. Quickly involving herself in writing (anonymously) for the stage, probably for Henslowe, whose theater was a short ferry ride from the Pembroke’s City residence, when Francis, determined to get the English Literary Renaissance moving no matter whom it upset, published an unauthorized version of Sidney’s sonnet cycle, Astrophil and Stella, in 1591, she quickly saw to it that the book was recalled, edited her brother’s poems to suit her notions of what would pass for respectable, and had it republished (minus the Oxford sonnet)––the first time in the Elizabethan era that a courtier poet of Philip’s standing was published under his own name. That he was dead made it all right, but it still represented a crack in the monolithic taboo against courtiers publishing their own works. More important, it forced Oxford to surpass everything he’d done up to then, and in so doing, find the voice we know as Shakespeare. The appearance of Sidney’s wryly sweet and witty sonnets created an instant sensation with a reading public that, due to Greene (Oxford) and Nashe (Bacon), had grown by 1591 to sizable proportions. Already adored as England’s warrior martyr, Sidney was now seen by Oxford’s reading audience as the greatest English poet since Chaucer. Annoyed at being blind-sided by Bacon and Mary and, once again, upstaged by Sidney, Oxford, bent on taking back the preeminence he cared about the most, outdid himself. By the end of the Elizabethan era it was clear that Venus and Adonis was far and away the most popular work published during that period. How interesting that it was just at this moment, when his world was under attack, that Oxford finally found the voice that would spread the English culture to the ends of the world. Bacon responded to Oxford’s crisis by publishing mournful ditties as Nashe to “Slumbering Euphues in his Melancholy Cell at Silexedra” and as Spenser to: “Our pleasant Willy” who is “dead of late.” Along with his brother Anthony, who had returned from France in 1592, Francis opened his doors to what remained of the disbanded University Wits, he and his brother continuing their secretarial service out of their rooms at Gray’s Inn. Mary helped by creating a new acting company in her husband’s name so that actors could continue to find work. But Marlowe’s murder in 1593, followed by the murder of his patron, Lord Strange, in 1594, sent the dire message throughout London’s little theater and publishing world that the good times were over. Matthew Roydon disappeared; Thomas Watson “died”; Thomas Lodge went to France to study medicine; George Peele went to work for the Mayor; and Lyly began his lifetime of begging, unheard, for another Court job. However low Oxford might fall it seems someone or something always came along to rescue him. By 1592 the Queen had stepped in and arranged a second marriage with an heiress, Elizabeth Trentham, whose brothers were in a position to take over his shaky finances while his new Countess arranged for the purchase of a manor in the northern suburbs suitable for a person of his (and now her) rank. In 1594 the ranking Privy Council patrons, Lord Hunsdon and his son-in-law the Lord Admiral stepped in to create out of the wreckage of the Queen’s Men and the Lord Strange’s Men, two new companies. The Royal company, with Hunsdon as patron, would have the advantage of Oxford’s playbook and the northern theaters, while the other, patronized by the Lord Admiral, would have some of his lesser plays, Henslowe’s theater on Bankside, and the advantage of Edward Alleyn as lead actor. Oxford would be free to write for new audiences, in particular the gentlemen of the Inns of Court in Westminster who would soon be entertained in style in the grand new theater planned by Burbage and Hunsdon for the great Parliament Chamber at Blackfriars. But this was not to be, for Robert Cecil, having acquired the wide-ranging powers of the Secretary of State in 1596, was not about to allow Oxford’s company access to the Westminster community. As the winter holiday season approached and Burbage prepared the new theater for use, Cecil saw to it that the Privy Council honored a petition signed by the residents of Blackfriars requesting that the theater be prevented from opening. This, plus the loss of their old public stage in Shoreditch, plus the death in July of their patron Lord Hunsdon (two weeks after Cecil became Secretary of State), plus the death of James Burbage the following February, left the Lord Chamberlain’s Men in a very sorry state. Bacon, with the help of Ben Jonson and perhaps also Oxford, fought back with a play produced at the new Swan theater on Bankside. The response suggests that it dealt roughly with Cecil, whose recent appointment as Secretary of State tipped the balance of power on the Privy Council too heavily towards the Cecil faction for many at Court. Concerned for his reputation with the Parliament due to convene in October, Cecil retaliated by closing all the theaters in London, which sent all the actors, including the Lord Chamberlain’s Men, on the road. When they returned, it was to publish the Shakespeare version of Richard III, in which comparisons were so clearly drawn between the wicked king and Robert Cecil that, as history records, Cecil’s reputation was permanently blackened. From then on he was stuck with the comparison, which sunk more deeply into the public psyche every time a new edition of the play was published, which occured with unusual frequency, eight editions in all, five of them before and a sixth joining the herd of libels that followed his death in 1612. The uproar caused by the publication and production of Richard III in 1597 intensified the need by the scribbling rascality of the West End to discover who wrote it, which in turn forced the Lord Chamberlain’s Men to put a name on the second edition, published the following year. No other options having presented themselves, they were forced to use the same name that Oxford had used four years earlier when he published Venus and Adonis, the name of one of printer Richard Field’s hometown neighbors. That this cost the Lord Chamberlain’s Men, or their patrons, something seems clear from the fact that it was at this same time that Field’s neighbor was suddenly able to afford one of the biggest houses in his hometown and to purchase the family crest that his dad had tried and failed to get twenty years earlier. The troubles launched by the Cecils’ takeover of Walsingham’s office and the deaths of so many of his literary and theatrical colleagues, plus perhaps his own poor health, caused Oxford to begin planning his escape from Court. As early as 1593 he was once again petitioning the Queen to return to him his inherited rights to the stewardship of the Forest of Waltham and the keepership of Havering palace. Doubtless aware of her playwright’s intentions, the Queen continued to refuse it, but following her death in 1603, Mary’s sons, now the third Earl of Pembroke and his younger brother, found the new King easily persuaded to let the old poet have what he wanted. Shortly after, Oxford invited his friends to a secret celebration to be held in the Forest on Midsummer’s Eve. The following day, June 24th, 1604, word went out that he was dead. With the author no longer around to provide more plays, the King’s Men turned some of his early pastorals over to Mary Sidney and John Fletcher to revise for audiences nostalgic for the “innocent” days of Elizabeth’s youth. An uneasy alliance was formed among those who agreed that it was important to publish his collected works in a format that would guarantee their survival. That this took a long time is understandable considering how controversial were some of the plays during Oxford’s lifetime, the concerns of his daughters who had their Cecil relatives to consider, friends of Oxford’s who may have held the best originals and who needed coaxing or payment, and booksellers who held the rights to some of the plays. By the time the book was finally published well over a decade later, all were gone who might have caused serious problems. Henry Howard and Robert Cecil were both long dead as was William of Stratford, although his wife was still alive until a mere two months before the book was available for purchase. Among the fairly small community of art-lovers and aristocrats to which Oxford and his patrons belonged, his authorship must have been an open secret for two or three generations. Then, as those who knew the truth for certain died, and their children died, fact faded to the level of a rumor, until the 19th century when a passion for delving into primary causes (Darwin, Marx, Freud) swept the culture at the same time that a renewed interest in his works turned Shakespeare into a cultural icon. However, if one follows the chain of connections over the years from poet to poet and patron to patron, it’s possible that the truth was known to the group that placed the statue in Poet’s Corner in 1741. With Oxford so utterly lost to history, enthusiasts turned first to Francis, whose writing skills, interests and education seemed to qualify him. The effort put into proving that Bacon was Shakespeare was the true beginning of authorship scholarship, as the Baconians published evidence showing how impossible it was that such a man as William of Stratford, with no education, no presence at Court, no legal training and no means of travelling to Italy, could possibly have written the works of Shakespeare. They also located in the works of Robert Greene the missing Shakespeare juvenilia and made the connection between Bacon and the works of Spenser and Thomas Nashe. Yet still the central truth, the existence of the Earl of Oxford, continued to elude them. This was finally supplied in the years just following World War I when a British schoolteacher realized that someone so unknown to literary history must have been equally unknown as the playwright during his own time. 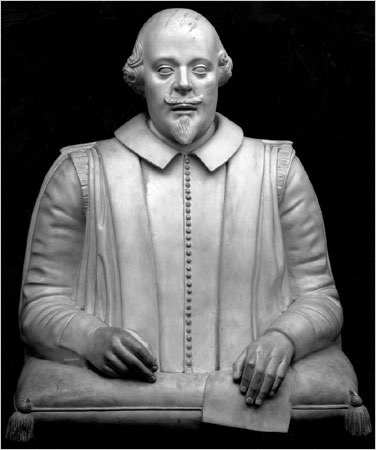 By creating a list of characteristics that Shakespeare reveals about himself in his works, and seeking in the right place, poetry anthologies, he found the Earl of Oxford, who fit the 18 characteristics in every respect. Thus arrived the situation as it remains today. Because historians and the left-brainers who run Wikipedia, based on what records the Cecils chose to leave us, continue to see Oxford as the kind of louche ne’er-do-weel the Cecils detested and did their best to destroy, we’re stuck with William, or Bacon, or Marlowe, or Mary, or (God help us) Edmund Campion, or almost anyone but the guy who actually did it! But refusing to deal with the facts about Oxford vs. William may not be the root cause of the problem, which is the utter refusal on the part of English historians to see the Elizabethan reign as a repressive regime dedicated to stamping out any glimmer of intellectual freedom. Until the historians are willing to accept that as a given, we’ll continue to get nowhere with Oxford, for they will simply continue to ask why on earth should he, or Bacon, or Mary, any of the other writers, wish to hide their identities? None are so blind as those who will not see. This entry was posted in anonymity, Authorship Question, Ben Jonson, Christopher Marlowe, Earl of Oxford, Edward de Vere, Francis Bacon, Mary Sidney, political repression, William of Stratford and tagged Anonymous, authorship question, Earl of Oxford, Francis Bacon, Mary Sidney, Nashe, Philip Sidney, Shakespeare Authorship. Bookmark the permalink. That seems rather more like a bushel than a single shell…very impressive and I might have been totally convinced if it weren’t for the ‘offhand’ remarks about Francis Bacon. And I agree that there are none so blind as those who will not see, and it should be crystal clear by now that we have all been purposely duped on true authorship issues. But there is a whole other level of what was going on back then that is not being addressed here, even in the very detailed aspects presented…and that is the very well structured, yet also hidden, metaphysical community and the relationships of those in this society and what they hoped to achieve. Again, the great frustration also comes from the fact that, unlike ‘celebrities,’ the true author(s) did not desire detection and as you show, went to great lengths to cover their identities and for very good reasons. Thanks for the input, Shellie. Any remarks about Bacon are not “offhand.” I’ve put up a fair number of posts regarding his role in the English Literary Renaissance (you can locate these by typing “Francis Bacon” into the search field). I knew from the start that Bacon had to be involved, I just wasn’t sure how. Later I discovered that long before I came to my own conclusions about his authorship of the Spenser and Nashe canons, a Baconian had stated this in print, and that the author of the Greene canon was also the true author of the Shakespeare canon. I’m not sure what you mean by the “metaphysical community,” but I am convinced that Oxford, Bacon, Raleigh, Northumberland, Essex, Southampton, the Pembrokes and others were involved in the creation of the modern Freemasons, that some of them, Oxford included, were involved in revising the ceremony that came down to them from the Templars, and that this is the true background to Sonnet 125 (his love for the youth is more real than any ceremony, however meaningful). And that Shakespeare’s true belief system is neither solely Catholic nor Protestant, but embraces both through the ancient Wisdom Tradition that lies at the heart of the Freemason and Rosicrucian traditions. Smith’s library is the key to Shakespeare’s belief system. There are a number of relevant side issues that, were I to address them all, would turn this “bushel” into a warehouse. My main objective here is to show how the plays, Oxford’s personal life, and current events all tie together. With this post I hoped to suggest at one thrust how, from the beginning, one set of facts and insights leads to another, tying the many threads on other pages together into a whole. Is there a diary, appointment book, letter or other documentation to support this assertion? Unfortunately, no. There’s nothing. Had there been anything left from that time this argument would have been over long ago. All we have are the buttery records from Corpus Christi College showing his presence at Cambridge by his expenditures and, where his name is missing, his absences. We have a copy of the letter sent from the Privy Council to the dons insisting that he was working for the government during his absences, which generations of scholars have assumed, lacking all information on Oxford and the crew at Fisher’s Folly, meant that he was working for Walsingham as a spy. All my conjecture does is to move him from working for Walsingham as a spy to working for Walsingham as a writer of plays for the Court at a time when Oxford was too busy providing plays for the Queen’s Men to continue to provide the Court with entertainment. Contributing to this scenario are the blasts at Marlowe and Alleyn in Perimedes, Menaphon, and Greene’s Groatsworth from Robert Greene (Oxford) and Thomas Nashe (Bacon). To assume that Marlowe would spy for the very government he so obviously loathed and that he continued to defy in his plays to the point that it led to his death or transportation is one more piece of the kind of nonsense we’ve been handed for centuries by historians who have no understanding of what drives the Theater or the kind of people who have used it throughout time to communicate with audiences hungry for truth. Sadly, even his defenders have gone along with the Marlowe as spy thesis. So far as I know, I’m the only one who’s seen this as a psychological impossibility. For more on Marlowe, you can read The Great Reckoning. For more on the reasons why we have so little information on the early history of the London Stage, check out The Cecils and History.